Virgin Australia will provide the only nonstop link between Western Australia and Tasmania from September when it commences Perth-Hobart flights. The three times weekly service with Boeing 737-800s will start on September 17 2018 and run on Mondays, Wednesdays and Fridays. 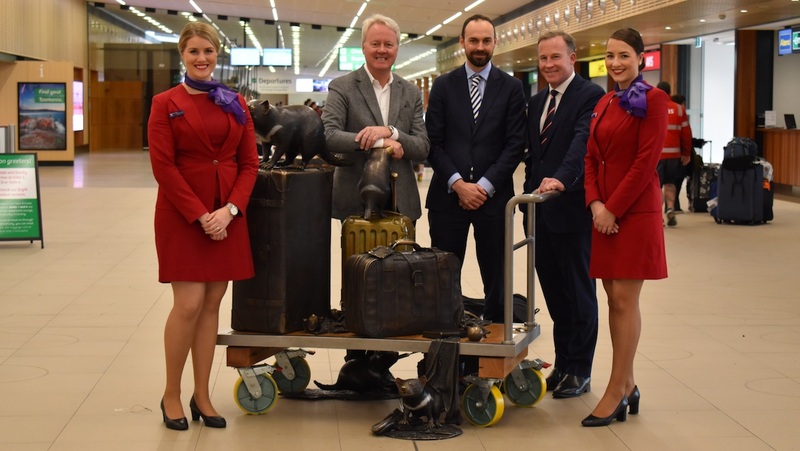 Virgin Australia general manager for network, revenue and alliances Russell Shaw launched the new route at Hobart Airport on Wednesday alongside Tasmanian Premier Will Hodgman and the chief executive of Tasmania Tourism John Fitzgerald. “Virgin Australia is proud to deliver a faster, more convenient and affordable way to travel between Hobart and Perth,” Shaw said in a statement. Currently, those travelling between Hobart and Perth usually connect via Melbourne or Sydney. Perth will be Virgin Australia’s fourth nonstop route from Hobart alongside service to Brisbane, Melbourne and Sydney. It will operate as an afternoon departure from Hobart on Fridays and an evening departure on Mondays and Wednesdays. From Perth, the Friday flight takes off in the early morning and departs at lunchtime on Mondays and Wednesdays. Virgin Australia’s 737-800s are configured to carry 176 people comprising eight business class seats, 30 extra legroom Economy X seats and 138 economy seats. Premier Hodgman said the service would help boost tourism to Tasmania. “The Tasmanian Government warmly welcomes this new service which will increase the opportunity for people to experience Tasmania’s unrivalled natural environment, world class produce and events,” Hodgman said. In addition to the start of Perth-Hobart flights, Virgin Australia said it had also recently added extra nonstop flights from Hobart to Brisbane and Sydney, as well as a seasonal flight between Brisbane and Launceston. Perth Airport chief corporate service officer Debra Blaskett said the new nonstop flight would cut travel times by at least an hour. There will be some slight time changes from October 28 to account for daylight savings. This is great news. Well done VA. It also means I think the first 1 stop link between HBA and LHR. Although would need to fly with rival airlines and change terminals. Potentially the Friday flight would be the only schedule that would work to connect with QF9. Also one might imagine that QF might not be far behind in announcing their own HBA-PER flights, presumably with better connectivity with QF9. Nevertheless this is a good and innovative new addition to the VA network. Now all HBA needs is a flights to NZ and Asia. Surely with the runway extension Asian services can’t be far away. One would imagine that a bigger terminal (extra floor and aerobridges) would be a great addition to HBA. I fly semi-regularly to Tassie and recently travelled to LST for the first time. I must admit LST has a terminal experience to probably rival HBA. Although it felt slightly strange walking upstairs to the arrivals hall. I don’t think I’ve ever done that before. As the state capital surely HBA deserves a world class terminal experience. Obviously it needs to be on a smaller scale to the larger capital cities. However an extra level and a few aerobridges should be a no brainer. I know the airport authorities say they don’t need aerobridges as HBA is the driest capital city in Australia and they want passengers to be welcomed by getting a crisp blast of fresh Tassie air when they disembark. That’s all well and good but it sounds to me like an excuse not to invest in and future-proof the place. I think you will find Hobart does not have the market for two airlines on the Perth run. Quite expensive for familys with small children. Hopefully cheaper airlines will follow suit. VA has opened up the gate and well done to them, but it will cost me around 1600.00 to bring my daughter and two small children home for a much needed holiday. Much appreciated Virgin, but it will take a while to save them from the gruelling layovers in Melbourne that come with the better prices. All capitals should be linked without exception. As a former Tasmanian now living in Perth with a partner and baby, this is fantastic news! As soon as I saw this, I booked flights on the very first flight on 17 September and will be flying direct from now on. I have been waiting for years for direct flights to Hobart. In my personal experience, flying from Perth to Hobart via Sydney or Melbourne can actually take up to 12 hours of travelling, as flights from Sydney or Melbourne are often delayed or rescheduled. On occasion, I’ve booked one stopover but had to actually make two (both Sydney and Melbourne) due to delays and rescheduling. I can now fly home to see my mother without sitting in Melbourne for hours !! Thank you Virgin. At last, no more awful mind bending waiting time at boring and uncomfortable Melbourne Airport. How long in hours is it now? We get on at Perth and off at Hobart. What is that now 4 hours? I go three times a year with my daughter. So wanted my parents to come but the journey was too long. Now we can all enjoy the best place in Australia with ease. Brilliant! Now that Hobart is getting these extra flights, when is Hobart going to get a Virgin Lounge?